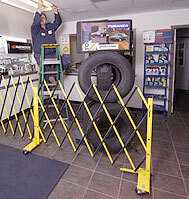 Utilize aisle gates to temporarily segment off retail or warehouse aisles, service work areas, or hallways while work or cleanup is being done. These gates are easy to hand transport at just 12 pounds per gate. Carry-on handle makes it easy to grasp and move. Gates can be linked together to form corners or any length desired for your application. Utilize aluminum aisle gates to temporarily segment off aisles and areas in freezers, cold storage and washdown environments while work or cleanup is being done. These lightweight gates are easy to hand transport. Carry-on handle makes it easy to grasp and move. Gates can be linked together to form corners or any length desired for your application.